The Russians not only interfered in the 2016 presidential election, in all likelihood, they changed the final outcome. By hacking the DNC and John Podesta emails and releasing them periodically throughout the general election campaign via Wikileaks, the Russians were able to reinforce issues detrimental to Hillary Clinton’s campaign and keep them at or near the top of voters’ collective minds. Without this manipulation, it is unlikely an issue such as Hillary Clinton’s conflicts of interest with respect to the Clinton Foundation would have received as much media attention as it did. Using Google Trends search data as a proxy measure for the campaign issues most interesting to Americans over time, I found that variation in these inquiries were highly correlated with the probability Hillary Clinton would win the election (as measured by futures contract prices on the Iowa Electronic Markets). The following may not be definitive proof that the Russians changed the 2016 election outcome, as that may never be found, but it gravely wounds my previous belief that the Russians had ‘no substantive’ impact on the election. My earlier analysis of the impact of social media on voters’ preferences in the 2016 election found that “weak” or “leaning” Republicans that actively used social media for sharing political information had significantly more negative attitudes about Hillary Clinton than other “weak/leaning” Republicans. That study did not address, however, the impact of specific Russia-related tactics, particularly the hacked emails belonging to the Democratic National Committee and John Podesta and released by Wikileaks (and DCLeaks) periodically throughout the 2016 campaign, starting in late June and ending in early November. While some opinion survey data conducted during and soon after the 2016 election did ask about topics contained in the hacked emails (such as the ‘rigging’ of the Democratic primary system or the alleged conflicts of interest related to the Clinton Foundation), such cross-sectional data are difficult to use for showing causal relationships and opinion change over time. (1) The Clinton win probability declined by about 20 percentage points during the Republican National Convention and heading into the Democratic National Convention. (2) The Clinton win probability then surged by over 30 percentage points after the Convention. (3) But then her win probability declined by over 30 percentage points between mid-August and the first debate in late September. (4) But then she re-surged by over 30 percentage points during the debate period. (5) Only to decline again by about 23 percentage points following news of the Obamacare premium hikes and the release of the infamous Comey letter. There was significant variation in candidate evaluations during the general election campaign and a significant percentage of it is probably explained by the national party conventions, the debate performances, the news of the Obamacare premium hikes and the Comey letter. But all of it? Not likely. 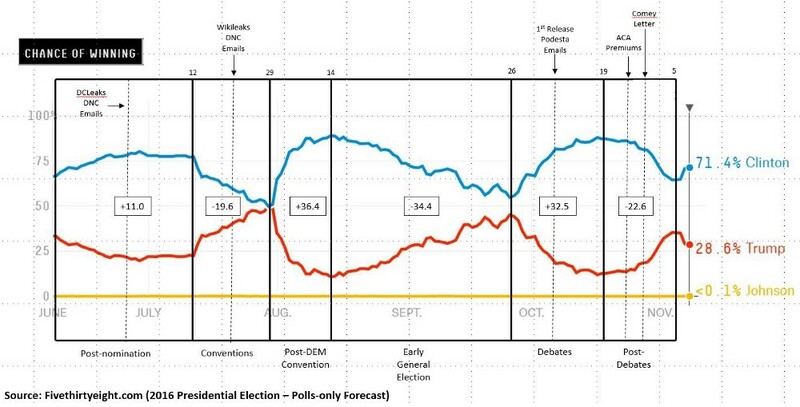 The early general election period is particularly interesting due to Clinton’s almost monotonic decline in her win probability, as it was a period in which she spent an unusually large percentage of time off the campaign trail to raise money or nurse the flu. Two issues dominated the news headlines during the early general election: The Clinton Foundation and Clinton’s health. We can rule the Russians out as a cause of Clinton’s collapsing during 9/11 ceremonies on a hot New York City September afternoon. The Clinton Foundation, however, is a different story. 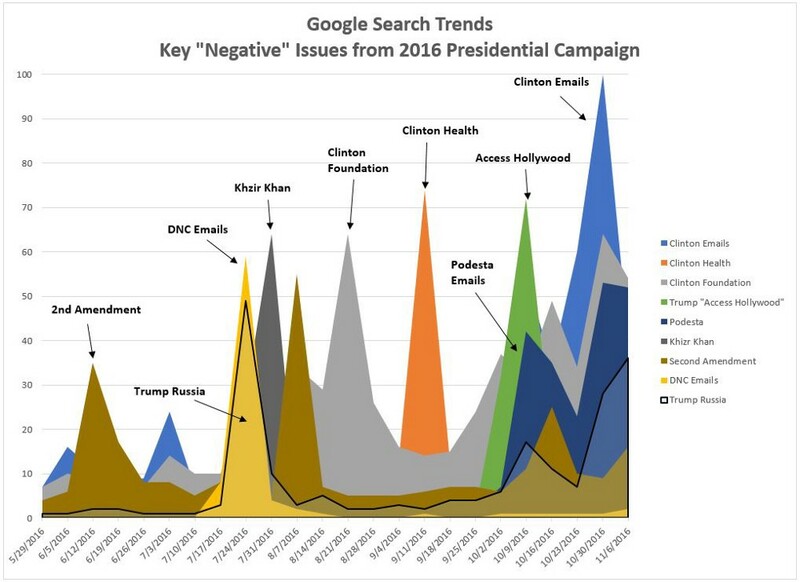 Figure 2 shows Google search trends by specific “negative” issues that arose or were emphasized during the 2016 general election. According to Pew Research, three-quarters of Americans spend at least some time on the internet every day and almost 80 percent of them use Google over the course of a month. 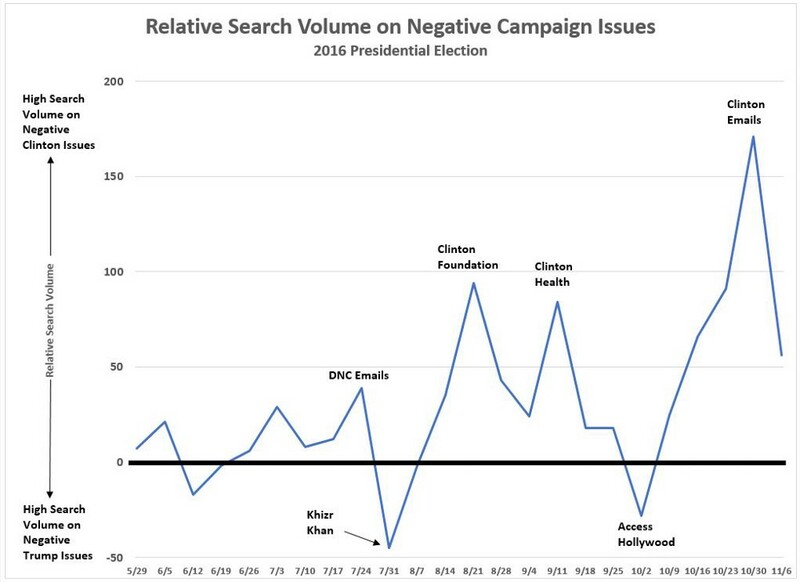 Using specific terms related to major election issues, I utilized the Google Trends service to calculate the relative number of searches on each election issue over the course of the campaign. I specifically chose ‘negative’ issues which anecdotally seemed especially potent in 2016. Figure 2 presents the relative search frequencies for these issues: (1) Second Amendment (associated with Trump’s thinly-veiled threat on Clinton’s life during a campaign stump speech), (2) the hacked DNC emails, (3) the alleged connection between Trump and the Russians, (4) the Khizr Khancontroversy when Trump mocked a Gold Star family, (5) the Clinton Foundation controversy, (6) Clinton’s health, (7) the hacked Podesta emails, (8) the Access Hollywood tape, and (9) Clinton’s deleted home server emails. The most frequent search was related to Clinton’s deleted emails peaked during the week of October 30th and therefore received the value of 100 for that week. Not surprisingly, Google searches grew steadily from late May to near Election Day. Also interesting is the joint spike in Google searches for DNC emails and Trump-Russia collusion the week of July 24th. Any assertion that the Trump-Russia collusion narrative was not factored in by voters before Election Day is most likely false. I have no doubt a lot of voters pulled the lever for Trump knowing or suspecting his campaign may have colluded with the Russians. The next step in the analysis was to calculate a weekly “relative” Google search advantage between Clinton and Trump. Operationally, issues ‘negative’ towards Clinton (e.g., Clinton home server emails, health, Clinton Foundation, DNC emails, Podesta emails) were summed, and Trump’s ‘negative’ search frequencies were subsequently summed and subtracted. 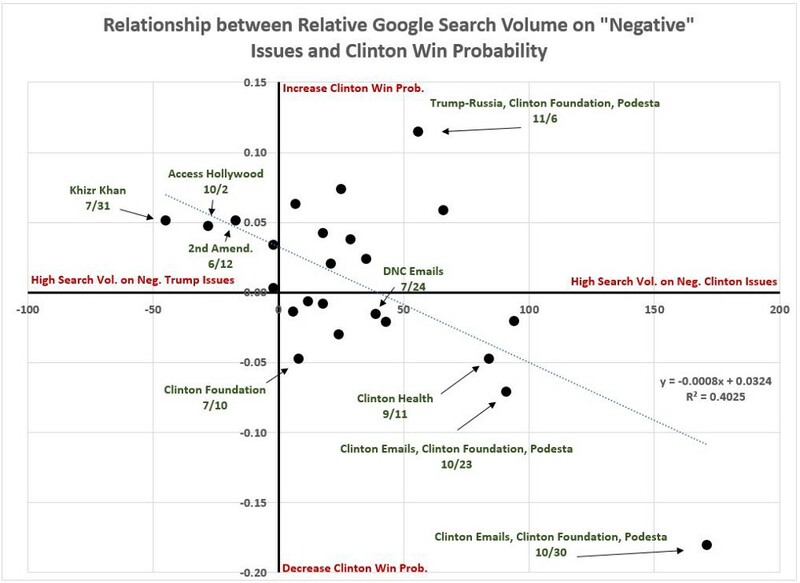 The new variable (Relative Search Volume) was positive if Clinton was receiving more negative Google searches than Trump and negative if Trump received more. Ten weeks stand out for their relative Google search volume. The weeks of July 31st and October 2nd are the only two weeks when the relative search volume strongly disadvantaged Trump (see Figure 3). Eight such weeks found Clinton strongly disadvantaged (the weeks of July 24th, August 21st, September 11th, October 9th, October 16th, October 23rd, October 30th, and November 6th). I’m going to go out on a limb and say traditional measures of favorable/unfavorable press coverage (which tend to show both Trump and Clinton received similar levels of negative news coverage) fail to measure the true bias found in media coverage. Clinton took far more cleats to the back from the national news media than did Trump, at least based on what Americans felt were important enough issues on which to conduct Google searches. Now for the punchline. Figure 4 reveals the strong negative association between Americans’ Google search frequencies and changes in Clinton’s probability of winning the election (as measured by the Iowa Electronic Market’s winner-take-all futures market for the 2016 presidential election). The overall model explains over 40 percent of the variation in changes to the Clinton’s win probabilities. That is not too shabby for a two-variable model and 24 cases. What makes Figure 4 compelling to me is the one weekly case (October 30th) driving the strong negative association. That was the week of the Comey letter (which re-ignited interest in Hillary’s deleted emails) and three weeks after the initial release of the hacked Podesta emails by Wikileaks (which was still being heavily searched on by Americans). Equally important, a surge in searches on the Clinton Foundation occurred in that second-to-last election week. If we go back and recall the contents of the hacked Podesta emails, one of the biggest revelations regarded Clinton’s potential conflicts of interest as Secretary of State and the Foundation. If you look at Figure 2 again, there is a clear correlation between searches on the Podesta emails and the Clinton Foundation. The BBC created a useful summary of the thousands of Podesta-related emails posted online by Wikileaks (That summary can be found here). Contained in them were inside conversations going on about Hillary Clinton’s tone deaf understanding of the issue. Mrs Clinton’s aide Huma Abedin, usually known for her unflinching loyalty, was blunt in her criticism of her boss over a Clinton Foundation summit in Morocco. The implication from the leaked emails is that a $12m donation from the king of Morocco was dependent on Mrs Clinton attending the summit. “Her presence was a condition for the Moroccans to proceed so there is no going back on this,” Abedin wrote to campaign manager Robbie Mook in a November 2014 email. In the end, Mrs Clinton decided not to attend and sent husband Bill and daughter Chelsea instead. There is no record of a $12m donation. The Clinton Foundation controversy is not nearly as interesting to the news organizations without the concurrent Podesta email revelations. The emails were like pouring lighter fluid into a fire. In other words, I find it difficult to deny the importance of the Podesta emails at keeping alive an issue that weighed negatively on Clinton’s campaign. Not convinced? I don’t blame you. There are a lot of causal steps between a voter doing a search on Google and changing their candidate evaluations. At best, the Google Trends search data is a proxy for a much more complicated causal process. In the final step in the analysis, I calculated an aggregate estimate of how each ‘negative’ campaign issue affected Clinton’s win probabilities over the course of the general election (Actual calculation: parameter for X in the two-variable model [b = 0.0008] multiplied by the summed search frequencies for each issue). In the following table (Figure 5) these estimates are likely inflated as I did not directly control for the party conventions and debates which had an obvious impact on the election. Nonetheless, I believe differences in relative effects across the campaign issues are reflected in Figure 5. First thing to note from the above table: the absolute values of the total impact on Clinton’s win probability are generally much higher for the ‘negative’ Clinton issues than for Trump’s ‘negative’ issues. Trump’s worst issue was his indirect death threat towards Clinton by way of 2nd Amendment supporters (a 22 percentage point increase for Clinton’s chances overall). The alleged Trump-Russia collusion and the Access Hollywood tape are second and third (a 16 and 17 percentage point for Clinton, respectively). As for Clinton, the DNC emails (which revealed the Democratic primaries were rigged against Bernie Sanders) did not have a large total impact on her win probability (-7 percentage points). Why? I believe because Hawaii congresswoman Tulsi Gabbard had pretty much made that point in January 2016 when, as she announced herself as the first Democratic House member to endorse Bernie Sanders, said the primary system was basically rigged against Sanders. It wasn’t news in July 2016 that the Democratic Party system was rigged. Everyone already knew it. What did have a large negative impact on Clinton’s chances were the issues of the Clinton Foundation (-49 percentage points), the deleted Clinton emails(-41 percentage points), Clinton’s health (-21 percentage points), and thePodesta emails (-19 percentage points). As noted previously, the impact of the hacked Podesta emails cannot be viewed in isolation from the Clinton Foundation controversy as the emails helped sustain the lifespan of the Clinton Foundation story. Without the Podesta emails, I seriously doubt the Clinton Foundation story would have been as prominent throughout October. In the month of October alone, the Clinton Foundation and Podesta emails reduced Clinton’s win probability by at least 30 percentage points. More than enough to change the outcome in a close election decided by a mere 80,000 votes. I still understand why some may not yet be convinced of the impact of Russia’s meddling. There may never be solid proof that the Russian’s changed the election outcome. But I now think the Russians did change the outcome and the prime suspects are the hacked Podesta emails and a corporate news media that birthed the Trump monster during the primary season and clearly relished sticking it to both Clintons throughout the campaign. Hillary Clinton wins in 2016 otherwise.